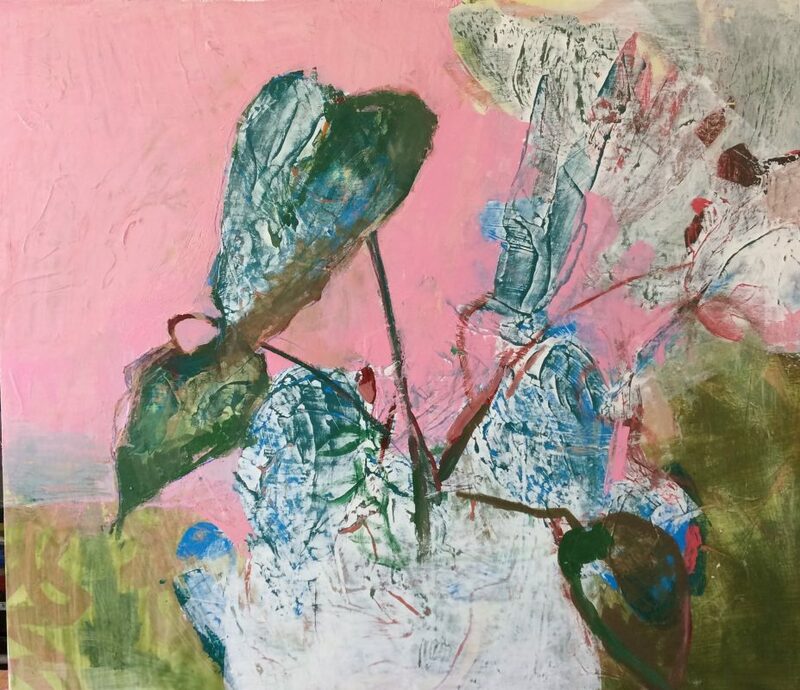 “Have You Watered the Plants Recently?” Elise Ostraff, acrylic and oil on wood panel, 2018. 1910. Matisse. All hail the death of “still lifes,” paintings which incorporated over-ornamentalized baked clay pottery, flowers sheared and arranged in water at their height of bloom, damask and linen made from once-living plants, mandolins and violins set out with all their elaborate fittings and gold filigree—once trees; or plucked oranges, apples with still-hanging-on leaves, grapes in swollen perfection, even entire dead brilliant red lobsters or luxuriantly-spread-out new corpses of hares or peacocks dangled over all: pyramid of harvested or imminent death. Finally, in 1910, a Matisse, “Still Life with Geraniums,” a geranium not on its way to “being spent”—in a pot full of nourishing sustaining soil: geraniums real, happy and rangy, with all the multi-jointed rangy terracing continuing splendor that is a geranium, suggestive of the branching, continuing patterns in Oriental rugs (modern art, some say, was birthed by Oriental rugs, how Matisse went to town with that, working their wild, arabesquing plant motifs into every rampant, patterning brushstroke). And 1910 is also the year the Rio Grande train depot in Salt Lake City was built. Its vast lower walls are lined with softly buffed maroon panels of granite, its dark tea-rose-colored paint surrounds its vast hundred-paned Gothic arched windows far up above, all forming conservatory and grand ballroom for this collection of artwork by the women Ostraff: Melinda Ostroff, Jenny Ostraff, Elise Boucher Ostraff, and Alexis Fryer Ostraff, bound by blood and marriage, and now artistic subject, in their Familiar Flora: Four Visual Responses to Living with Plants. Ah, women, you think, women painting flowers—how predictable! (Women once held dominion over china: predictably, maddeningly festooned with improbably perfect flowers.) But still life — in which the Dutch particularly celebrated plunder acquired from trade, and with which old Egyptians long ago provided for their pharaohs and others buried underground, to become—presto!—magic sustenance—is a magic trick now dead. Picasso and Cezanne and Braque, bless their puzzle-taking-apart jazzy souls, also helped finish it off, with their disjointed, floating forms in paintings each mockingly entitled “still life” to mock and displace the whole hoarding, show-off mess of still lives. Still lives were a hoarded staple, just as in the Egyptian tombs—hoarding work through the winter, when they could not be outside to paint. Surrounded by snow outside, indoors artists could show off how real they could make dying things look. But plants and their offspring in this exhibit are free-range: Melinda Ostraff’s studies of a horse chestnut seed, in three encaustic panels, “Horse Chestnut #4, #2, #3,” shows its prickly fall to earth, its curled vital almost animate form, its intense seedness. These encaustic panels are a wonder, melted wax as creamy and modulated as rich askew accidental glazes on pottery. Other works by Melinda, an ethnobotanist who in a special, majestic way does as she pleases, suggest outer space, or undersea. She also has a fearless child’s focused, yet unfocused, sense of play. Her materials find their own fate, midstream, midwax. “Pattern # 20” could be a great iceberg under the surface of a vast ocean. Others, such as “Botanics #3,” a cajoling, comforting denim blue, are leaves layered upon leaves, a repetitive and soothing batik. Turn a corner at the Rio, and you find another numbered set by Melinda, suggesting resolute stands of birch, in wax of creamy, encompassing whiteness. 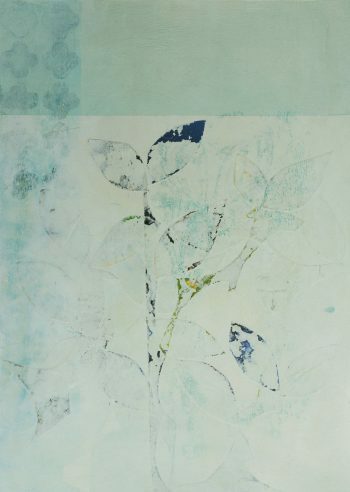 “White Geranium #1,” Alexis Fryer Ostraff, monotype, 2018. Geranium meets Warhol in “White Geranium #1, #2, #3”: Alexis Fryer Ostraff’s monotype prints are like different Warhol Marilyn Monroes: one a geranium anchored deeply by swerving golden and dark shadows, another dark, purplish, suggesting so strongly a pirate ship on a horizon from which pirates are leaping you might think the pirate-loving Howard Pyle or the magnificent Wyeths have wandered into the Rio. 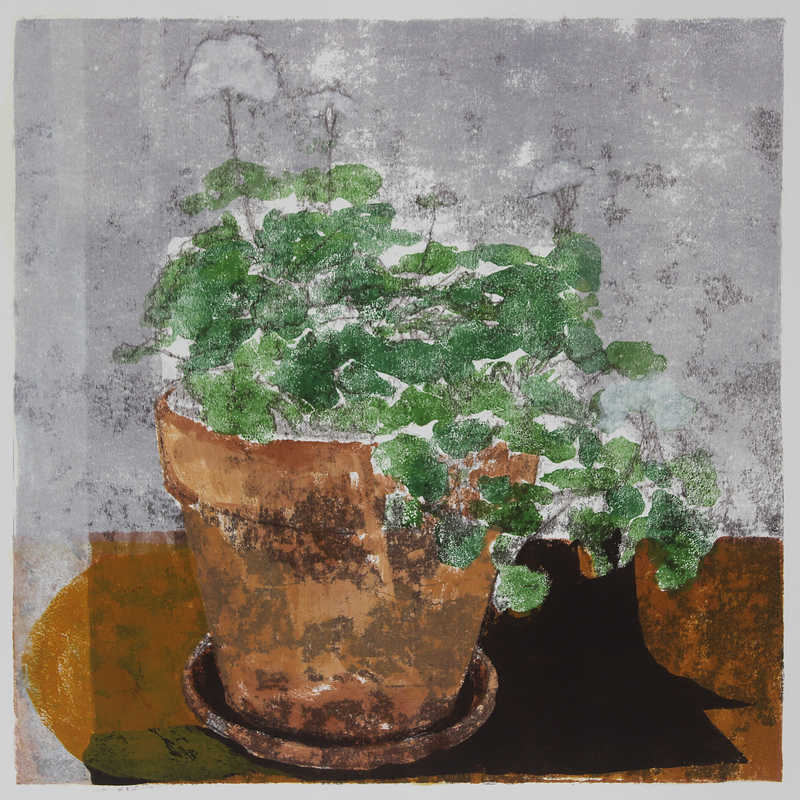 The last geranium in the series of three is a monotype of one serene, imperially green geranium, resplendent as a many-terraced Chinese palace, its bloom triumphantly moon-white; a geranium released from its previous monotype moods. Alexis does this again in her “Christmas Cactus” and “Jade Plant” monotypes (again, each a set of three): in the cacti prints, one is a shudder of blue which makes it seem time-lapse photography has charted the potted plant’s movements as it grew; another cactus is a dazzle of startled yet baffled and dormant-seeming pink; and a final monotype is (again, the third) the one in which the plant seems to reassert itself with darker, more certain color: even the pebbles in the cactus’s saucer have regained their sturdy, resolute rockiness. 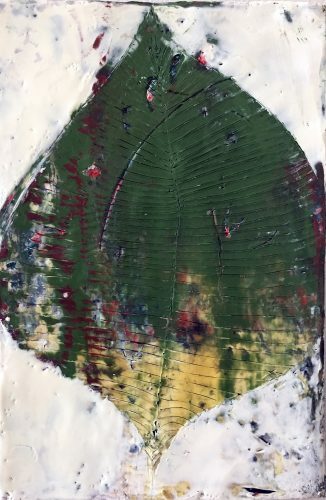 “Ireland Botanics #10,” Melinda Ostraff, encaustic, 2018. Rarely, images in the show are of single leaves. Melinda’s “Botanics #1,” is sole green leaf, making you think of fortune-tellers reading tea leaves in tea cups, or studying palms: yet here you see one leaf can look like a human palm; you realize that green leaf has its own destiny, too. More paintings by Elise Ostraff invoke the Hawaiian shirt, leaves and huge blooms wildly aswirl, as if glimpsed falling, and flattened into a fabric. In one, “Have You Watered the Plants,” two huge blooms are chillingly, blankly white: they seem to be asking the viewer (or the waterer) to imagine their absence, or death —a preview of ghostliness. Where would an exhibit with flowers in it be without roses? In “Rosebush #1, #2, #3, #4,” Jenny Ostraff gives us roses that are shockingly distant and pale, and imbued with blueberry shades, peaches, apricots. Somewhere (yes: this is an exhibit that will make you hungry) there is a new Creamsicle in the future, made with honey, milk, fruits, and errant rose petals drifting through, similar to these dreamy collages by Jenny, many in dark frames, highlighting their almost melted, wispy delicateness. “Rosebush #3,” Jenny Ostraff, mixed-media collage, 2018. The ghost of remembered scents fills this exhibit: anyone who has worked in a greenhouse or wandered into one of life’s greatest delights, the conservatory or indoor botanical garden, has smelled the finest smells smellable, emanating from the contained and condensed miracle of what Dylan Thomas in one of his poems called the green fuse. A growing roomful of jade plants in summer has a smell deeper and more peppery than any handful of newly ground pepper; a houseful of chrysanthemums in bloom smells more like wildflower honey than any honey actual bees have collected. Soil, when baking in greenhouse sterilizers to ensure no weed-seed survives, is the most exquisite surprise of all: it is precisely the smell of baking Boston brown bread, made with molasses and whole wheat and fat raisins. But amplified five times. If considering a painting, Cezanne said, take it outside, lean it up against any tree or plant. Looking at it leaning there, you will immediately know, he said, from how it looks with the plants behind it and above it, what’s right about it—and wrong. Here’s hoping a rooted orchid or a deeply potted jade tree will appear at this show: it can judge us all. Familiar Flora: Four Visual Responses to Living with Plants, includes works by artists Melinda Ostraff, Jenny Ostraff, Elise Boucher Ostraff, and Alexis Fryer Ostraff, Rio Gallery, Salt Lake City, March 16-May 11, opening reception March 16, 6-9 p.m. as part of Gallery Stroll.